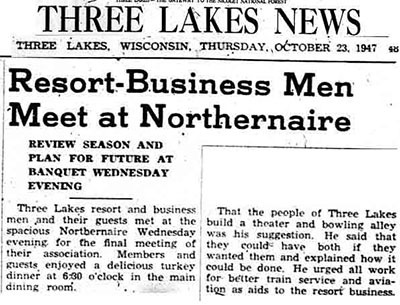 This meeting held in October of 1947 was the first step of what would become Three Lakes Center for the Arts. A second step was in the spring of 2004 when Donna Goeddaeus of Conover brought the idea of an art center to an intrepid group of Three Lakes women led by Anita Kendall and Linnea Ebann brought the second element and a third step was a meeting between Gay Scheffen and an anonymous couple fused the streams into what has become the multi-use building we know today. 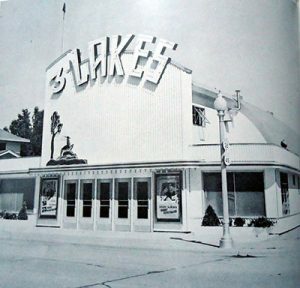 TLCFA started as a movie theater that the resort and business owners of Three Lakes thought was needed 70 years ago. This community theater is unique. The businessmen’s dream was realized by the sale of stock (a la the Green Bay Packers) sold to the community to raise the money. An architect and builder was commission to design and build the theater. Work started in early December 1948 and the theater opened on June 12, 1949. The first movie was “Red River” with John Wayne and Montgomery Clift. Of the 93 movie theaters built in Quonset huts after WWII in the US, TLCFA is one of only six Quonset theaters left in the entire country still showing movies. Also it is the only such theater that has been restored after going dark for over two decades. Built for the Military in WWII, the “elephant” Quonset found its way to Three Lakes in 1948 and became a center of movie entertainment throughout our area. 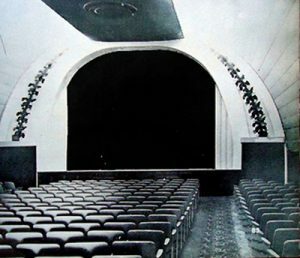 A little known fact is that the original theater was designed and built by a local sports hero, Cy Williams, who won an award for the design. 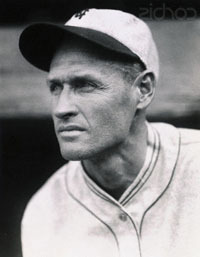 Cy was one of the all time great baseball players – a peer with players like Ty Cobb and Babe Ruth. He was only the second person ever to hit 250 home runs (Rogers Hornsby did it first) – and that was during the “dead ball” era. 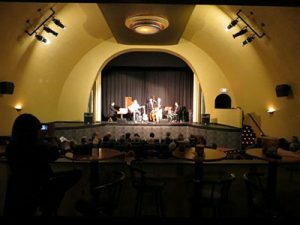 Then, due to the pressure of TV, the theater went “dark” in the mid-fifties until Steven Conway, a theater owner in Crandon, took over the operation in 1958. It operated in the summer under the Conway’s until about 1972. Parenthetically in 1967 it was managed by Steve Conway Jr. Steve hired a local girl, Alma, who did concessions and learned to run the projectors. It must have worked out since they married and have been active in the TLCFA and the theater business in Eagle River and Woodruff. The movie operation was closed in 1972. In 1974 the property was purchased by the LaPlatte’s who updated the façade and added a second floor with 4 apartments. 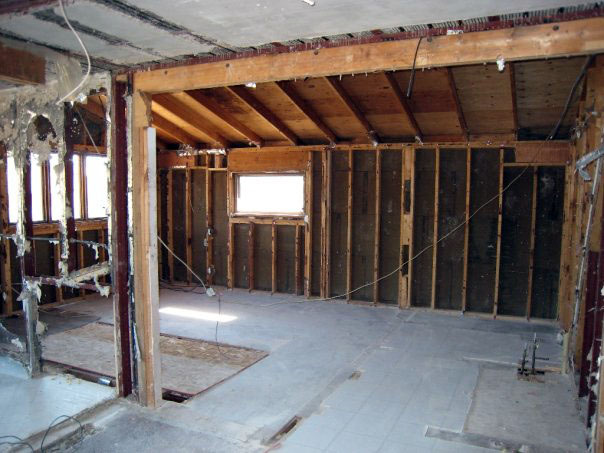 They lived upstairs but plans for the main floor never materialized. 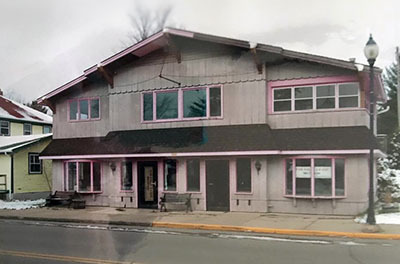 In 1992 the building was again sold and the downstairs was remodeled into retail space and did business as the “Hodge Podge Lodge” In 2005 the building was sold again to John Mason, however his plans for the building never materialized. 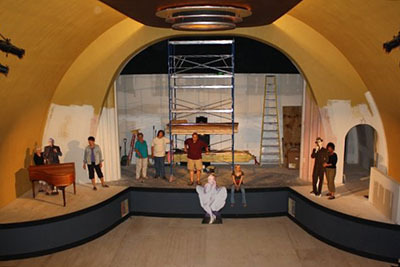 In 2007 an anonymous donor gifted TLCFA with $250,000 to purchase the old theater. 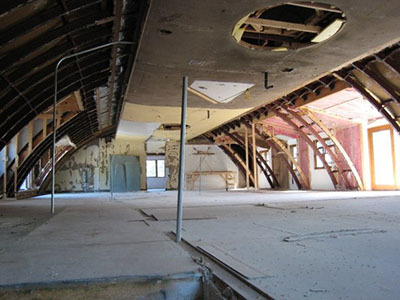 A combination of professional contractors and skilled volunteers restored the interior of the quonset and in the process found that the original décor of the theater had not been removed. The renovation of the building has taken over $400,000 of donations and fund raising to date and thousands of hours of volunteer effort. 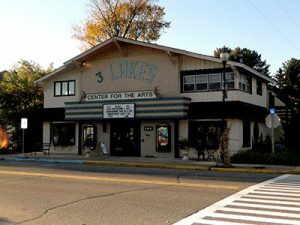 It has once again become a Three Lakes community-wide project, led by the Three Lakes Center for the Arts (TLCFA- a 501c). The old quonset came alive again, with Film, Art and Music on July 1, 2008, with a performance of the Restoration Jazz Band. In 2015, the gallery space was redesigned and updated to comply with ADA and state codes, adding more bathroom space as well as more usable wall and floor space. The redesign help provide a more open feeling and a unique gallery LED lighting system. In 2018, we began our 10th season with a more ambitious schedule than ever. We owe much of what has been accomplished to our dedicated volunteers who people the gallery, sell movie tickets, make and sell popcorn, along with soda, candy, wine and beer to movie and concert goers alike. The goal of TLCFA is to provide a center – a hub – for arts and entertainment in our locale, just as it did in 1946 when it was built. All of us in and around Three Lakes can be proud of the fact that this theater is being saved while so many have been destroyed. If you want to lend a hand to the adventure, let us know. Contributions are, of course, welcome but there are so many other ways to help. 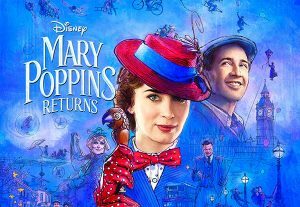 We need volunteers to sell theater tickets, run the concessions, be part of the gallery team, or just make a special effort to keep up with our changing movie and live performance programs and attend and enjoy them. If you live outside the area, spread the word about this unique theater and art center. If you live here year round, feel free to brag about what a special thing your community is doing for the arts and entertainment up here in the North Woods. Three Lakes really is a place where dreams do come true – together we are once again proving that!